Notorious BIG & Junior M.A.F.I.A’s “Player’s Anthem” is this week’s focus for Throwback Thursday for unfortunate reasons. This Saturday, it will be the 16th anniversary of the Notorious BIG‘s untimely death after he was assassinated in Los Angeles on March 9th 1997. “Player’s Anthem” was the debut single released by Junior M.A.F.I.A and was produced by DJ Clark Kent who sampled The New Birth‘s song “You Are What I’m Talking About“. The song can be considered some-what of a success commercially as it was certified gold by the RIAA on September 7, 1995 for sales of over 500,000 copies. Junior M.A.F.I.A clearly needed Notorious BIG on the track to boost the sales for “Player’s Anthem” which was the first single for the 1995 debut album titled “Conspiracy“. The album didn’t sell as well as it only sold 69,000 copies in it’s first week. The album title “Conspiracy” is very fitting to the whole story and speculation behind Notorious BIG‘s murder (like-wise can be said about his former friend/nemesis, 2Pac‘s death). There have been countless conspiracies as to who murdered Notorious BIG and as to why. Some documentaries such as Nick Broomfield‘s 2002 release titled “Biggie & Tupac” concluded on very interesting conspiracies as to what happened to the Notorious BIG. The video for “Player’s Anthem” depicts Junior M.A.F.I.A touching down in their private jet whilst federal agents are watching them via security cameras. As you’ll see in the video, this was before Lil’ Kim lost her damn mind and ruined her face with all the plastic surgery. 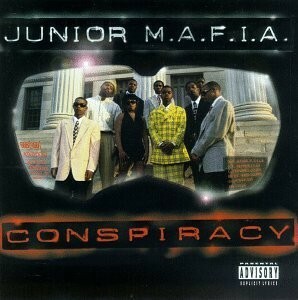 “Conspiracy” was released in 1995 and is still available on Amazon.